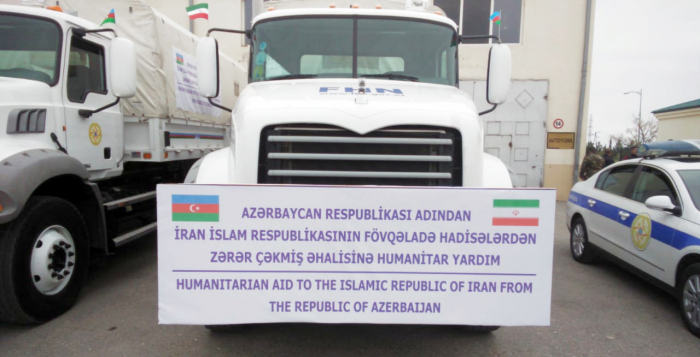 Under the instructions of President Ilham Aliyev, the Azerbaijani Ministry of Emergency Situations has sent humanitarian aid to Iran in connection with the natural disaster caused by heavy rainfall, AzVision.az reports. Deputy Emergency Situations Minister, Lieutenant General of Medical Service Faig Taghizadeh told reporters that the humanitarian aid, worth 950,000 manats, includes 166 kitchen sets, 3,000 bedding sets, 75 tents, 150 water pumps of different parameters, 5 4-meter rubber boats, 140 worker garments, 320 rescuer garments and 200 rescuer vests, as well as two Caterpillar and Komatsu excavators. The natural disaster in Iran has caused human casualties and destructions.